A must have for any seasoned golfer! The black aluminum carabineer is slightly over 3" and conveniently attaches to a golf bag for easy access. This funcional tool comes complete with stainless steel features. 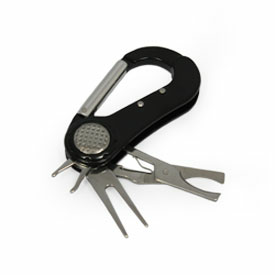 Attached Tools: - detachable magnetic ball marker - divot repair tool - spike tightener - cigar cutter Pricing includes: - black alumninum carabineer - 1 PMS matched color screen printed on the carabineer. Production time: 4 weeks after artwork approval. Rush service is available.